Wash the rice and soak for 15-20 minutes. Drain the water completely and set aside. Mince the soaked soy chucks in food processor. Set aside. Heat the skillet and add the Ghee. Once the ghee is heated, tip in the whole spices (Fennel seeds, Star anise, cardamom, cinnamon, clove and bay leaf) and fry till fragrant. Add the onions, chili and ginger-garlic paste. Fry till the onion are soft and the raw smell of ginger-garlic is gone. Add the coriander powder, turmeric powder and meat masala and fry till the oil start to separate. Add the chopped beets, minced soy and rice. Fry for 2-3 minutes. Add 2 cups of water and salt to taste. Cover and Cook till done. Turn off the heat and leave to stand for 5 minutes covered. 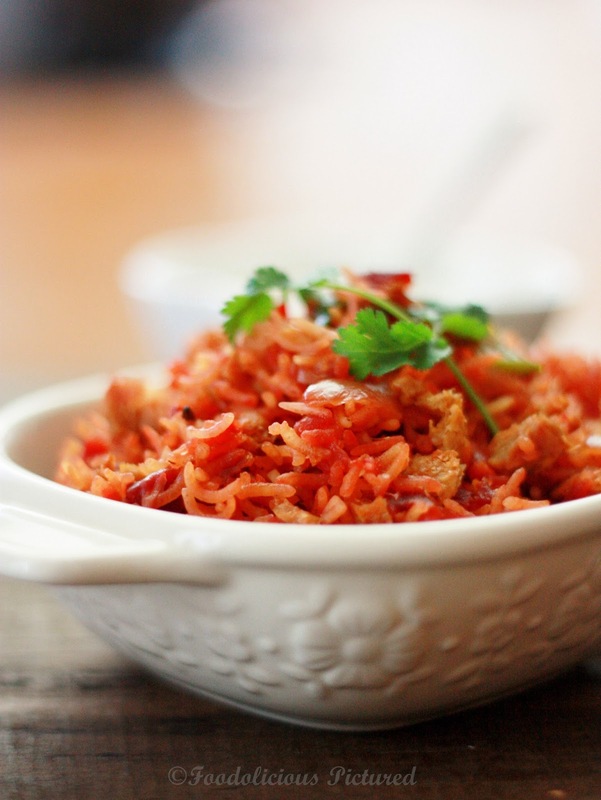 Remove the lid, fluff the rice with a fork. Transfer to a serving dish. Garnish with fresh coriander leaves and serve hot with Raitha. P.S – Adjust the spices to suit your taste. Wow! 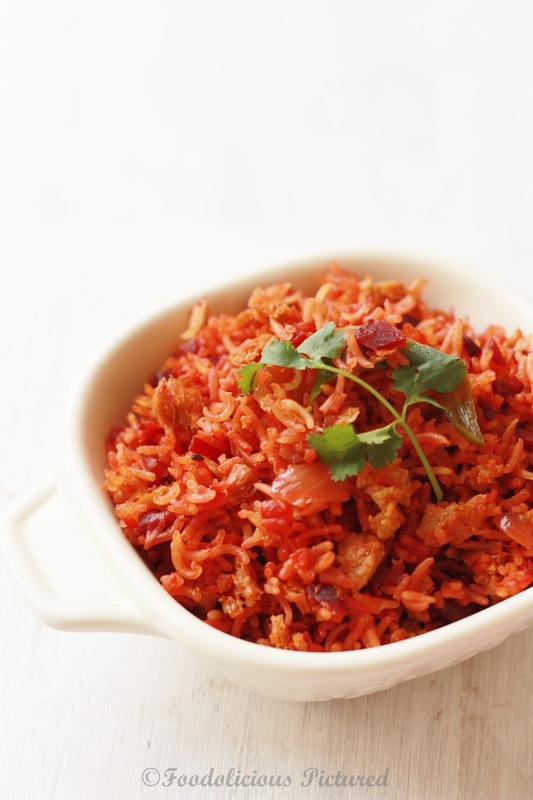 Love the colour of the pulao. Nice one pot meal. Thats a wholesome meal!Love your pictures against the white backdrop! Wow wow! love the colors u have done it so well pics are really attractive. 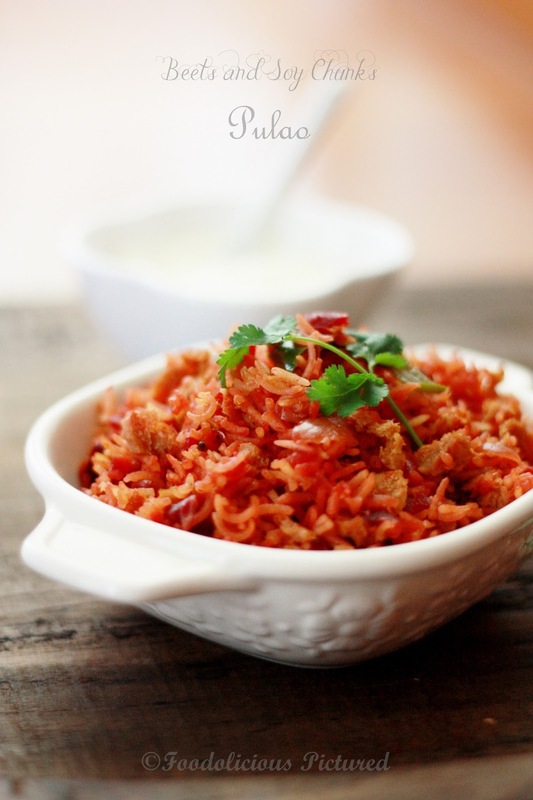 Pulao looks really yummy…soy and beet..nice combination.. 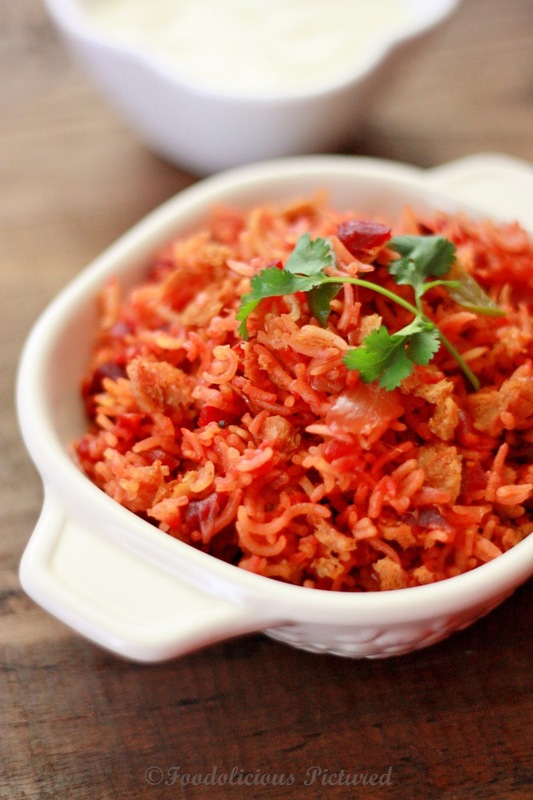 Vibrant and love anything with rice. Must and will try when I get back home after my travel venture.